In 1990, Claudio Bellini (born 1963, Italy) graduated from the ‘Politecnico di Milano’ where he received a degree in architecture and industrial design. Immediately after finishing his studies, Bellini started to work close... Read more to his father’s studio, Mario Bellini Associates. Claudio had the opportunity to embark on a series of international experiences, taking part in research projects in the fields of industrial, architecture and furniture design. The expertise of Claudio Bellini in office furniture make him one of the present days most influential designers, and led him to collaborate with worldwide furniture manufacturers such as Vitra, Frezza, Walter Knoll and Poltrona Frau among others. In 2006, Claudio founded the Claudio Bellini Design+Design where he mostly conducts technological research and studies the potential use of new materials. His studio has been selected by the Spanish magazine ‘El Pais’ as one of the ten most creative European design studios. 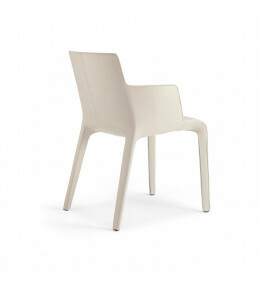 Gio Chair wih flexible backrest is made entirely from one material offering sumptuous comfort.